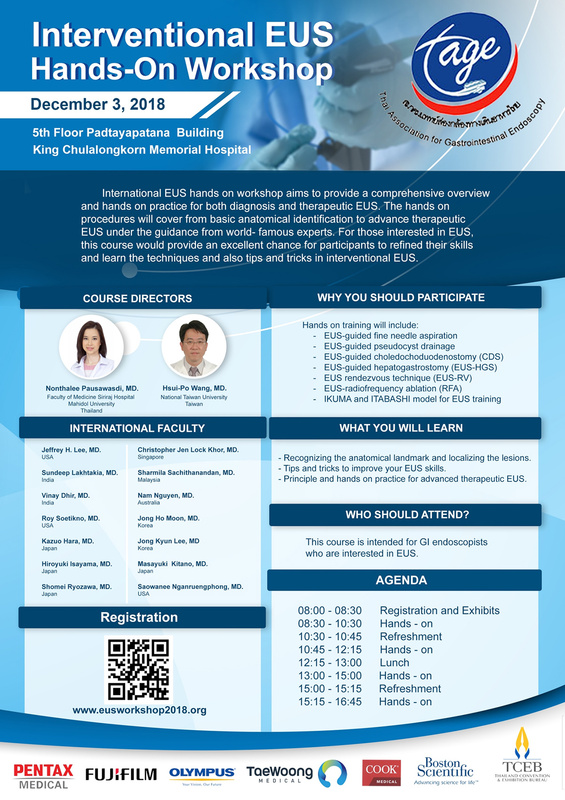 International EUS Hands-on Workshop "Make you practice perfect"
Interventional EUS hands-on workshop aims to provide a comprehensive overview and hands-on experience for both diagnostic and therapeutic EUS. The course covers from identifying basic anatomy to enhancing abilities in performing FNA and therapeutic EUS under the guidance of world-famous EUS experts. It will provide an excellent chance for participants to refine their skills and acquire the tips and tricks in interventional EUS. EUS has emerged and become a valuable diagnostic and therapeutic modality for gastrointestinal and pancreatico-biliary diseases. The interventional EUS hands-on workshop will feature a comprehensive overview of the rapidly evolving EUS procedures. The aim of this workshop is to enhance participants’ skills in both basic and interventional EUS including EUS guided biliary drainage and RFA using dedicated learning models specially designed for each technique. The participants will learn directly from many experts in the field for almost 6 hours in 14 stations. If you are looking to develop or improve your EUS skills, this is an ideal course for you to gain more confidence and level up your practice.